More than 60 million water plastic bottles are thrown away each day. Most of them ends up on landfills and incinerators, what leads to pollution of air and water and also huge losses of resources. But what if there was an alternative? Could you imagine a device that will convert those bottles into something you actually like? 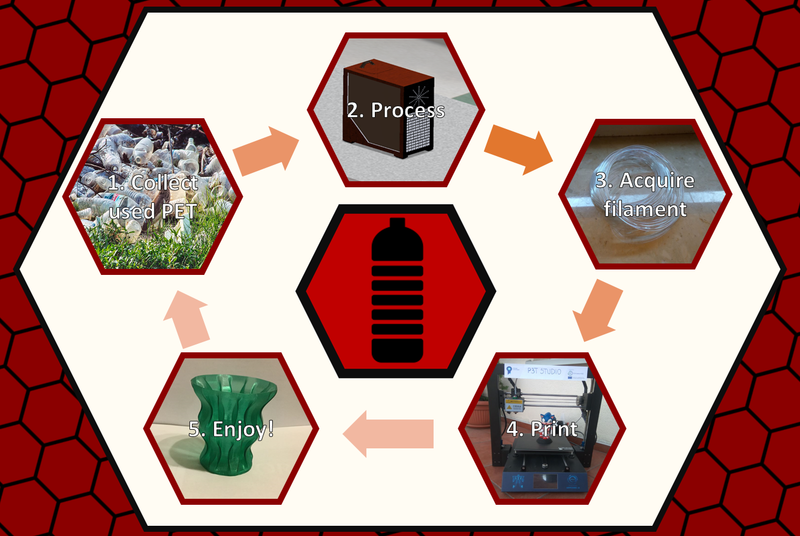 Our company made this dream a reality with a simple device, that processes plastic bottles into cheap 3D printer filament. With three single steps – Collect, Process, Print! – anyone can transform their garbage into anything they can dream of. This device not only reduces amount of waste, but also gives an attractive alternative for expensive printing materials. It also greatly decreases the volume of waste, so it is much more convenient to store. It will also teach people that processing their waste instead of throwing it away can be useful not only for environment but also for their wallets. So do not waste your waste – play with it!